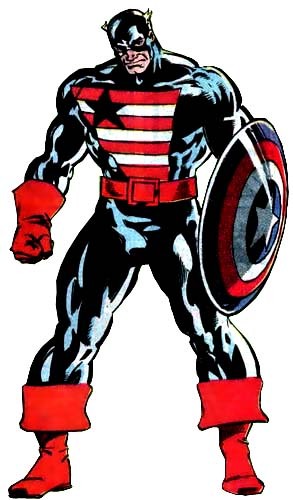 First Appearance: Captain America (vol. 1) #323 (Nov. 1986): "Super-Patriot Is Here"
First Appearance (Additional Details): (as Super-Patriot II) Captain America (vol. 1) #323 (Nov. 1986): "Super-Patriot Is Here"; (as Captain America VI) Captain America (vol. 1) #333 (Sep. 1987): "The Replacement"; (as U.S. Agent) The West Coast Avengers (vol. 2) #44 (May 1989): "Better a Widow..."
Teams/Affiliations: The Avengers; The Invaders; Force Works; The Jury; Omega Flight; S.T.A.R.S. Captain America (vol. 1) #350 (Feb. 1989): "The Six Captain Americas!" Force Works #0 (July 1994): "Destiny!" Force Works #12 (June 1995): "Green Fire!" The Mighty Avengers (vol. 1) #28 (Oct. 2009): "The Unspoken, Part 2"
The Secret Defenders #20 (Oct. 1994): "Death and the Art of Dying"
The Secret Defenders #21 (Nov. 1994): "The Aesthetic Imperative"
Super Soldiers #1 (Apr. 1993): "Memories - Part 1"
Thunderbolts (vol. 1) #23 (Feb. 1999): "Public Relations or Do Not Pass Go, Do Not Collect $200"
Thunderbolts (vol. 1) #28 (July 1999): "Castles in the Air"
Thunderbolts (vol. 1) #29 (Aug. 1999): "The Fundamental Force"